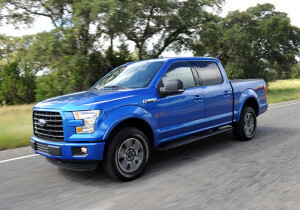 Update: Ford has responded to the Edmunds coverage of its staff attacking a gleaming blue Ford F-150 with a sledgehammer. “The price jumped from $106.28 to $887.25. For a taillight,” he wrote. The dealership estimated that fixing the damage on a steel F-150 “‘would take half the time,'” he reported. Part 3: The dealership, Santa Monica Ford, told Langness that the work would take 20 hours to fix. Their aluminum labor rate was $120, but since it was out-of-pocket, they gave him the regular $60 rate. The cost, of course, takes into account all the time and money the dealership spent to get its shop up to speed on aluminum repair. It’s possible that the cost could decline over time as shops get more accustomed to fixing it and recoup their investments. Repairer Driven News is a little jealous of Edmunds.com, which recently held a sledgehammer “car bash” on an Ford F-150 to test out not only how the aluminum stands up to a collision, but what the repair process would be like. The aluminum did rebound like the T-1000, but the impacts still left dents and creases and cracked the taillight. It’s kind of what one would expect, but it’s interesting to see the process in action from an unbiased source like Edmunds instead of, say, a customer’s word-of-mouth rant on a message board. Edmunds is promising an update later today, so keep checking.